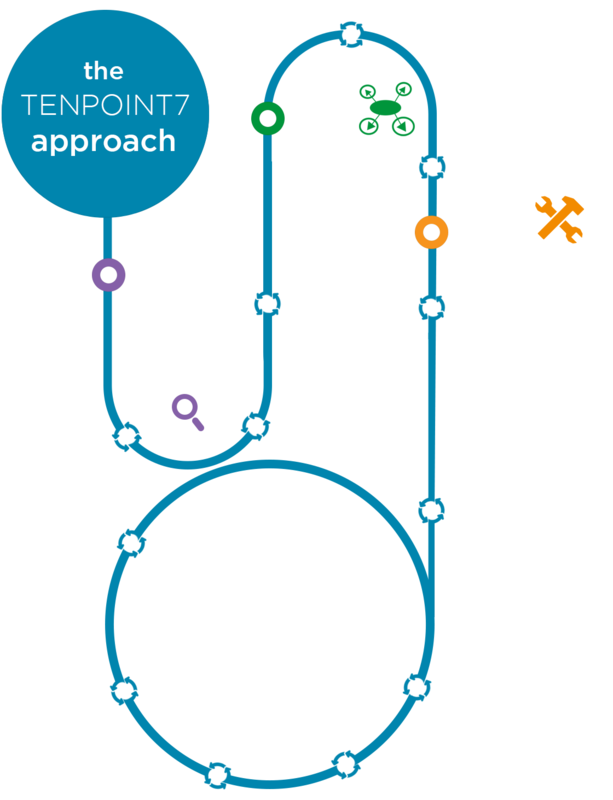 At TenPoint7, we understand that complexity and speedy execution are a given for Business Intelligence initiatives. Therefore a structured yet agile approach from the beginning is critical for project success. With our cumulative experiences working across Business Intelligence projects in different verticals and varying complexity, we have adopted our own practical methodology adapted from the Ralph Kimball data warehouse approach. We start every project by understanding the client’s business through close collaboration with the business stakeholders and business domain experts to explore business Information requirement and strategic business goals. From there, the business problem or business opportunity is clearly defined. Along with client technical experts, we also explore client’s technical infrastructure as well as non-technical infrastructure, which help us to propose a cost-justified BI solution that brings client benefits of either solving a business problem or taking advantage of a business opportunity. Along with client team, we address the scope and deliverables of business intelligence project including a proposal of system conceptual architecture. An application prototype is created to quickly prove the concept and idea. Prototyping also allows client to see the potential and the limits of the technology, which gives them an opportunity to adjust their project requirements and their expectations. After the prototyping, project planning focuses on resource and skill-level staffing requirements, coupled with project task assignments, duration, and sequencing. The resulting integrated project plan identifies all tasks associated with the Business Dimensional Lifecycle and notes the parties involved. Throughout BI system building process, we leverage Agile as our project management methodology which allows us to divide large project into small iterations. The first track of an iteration is gathering detail requirement with data analysis. The business requirements impact almost every decision made throughout the iteration. Business requirement determines what data must be available, how it is organized and how often it is updated. In technology design track, along with business requirement, we consider other factors— current technical environment, and planned strategic technical directions—simultaneously to establish the technical architecture design. In data integration track, we start by modeling key business processes to address candidate data marts for data warehouse. After that we build staging tool to extract, transform and load data from source systems to the data warehouse. Data extraction always exposes data quality issues that have been buried within the operational source systems. Since data quality significantly impacts data warehouse credibility, we consistently address these quality problems during data staging. In analysis and reporting track, we analyses data and visualize the information by constructing analysis reports or even perform advanced analytic to discover insight information hiding in the data. An end user application is also developed in this track. We define a set of standards for end user applications which describes the report template, user driven parameters, and required calculations. In Deployment track, we prepare a ready system and make sure end users are able to access properly business intelligence system. An extensive planning is required to ensure data availability, user education. Besides, user support and communication or feedback strategies also is established before any business users have access to business intelligence system. We understand that plenty of work remains following the initial deployment of the data warehouse. Therefore, we need to continue focusing on providing our clients with ongoing support and education. We also focus attention on the back room, ensuring that the processes and procedures are in place for effective ongoing operation of the solution. Besides, data warehouse acceptance and performance metrics are measured over time and logged to support marketing of the data warehouse. Prioritization processes are also established to deal with the business demand for evolution and growth. After the project priorities are identified, we go back to the beginning of the lifecycle, leveraging and building upon what has already been established in the data warehouse environment, with a focus on the new requirements. Check out our approach to Data Science.